The Star Trac eSpinner is based on the best-selling NXT frame and comes with an embedded touch screen display system. You get a great workout with the on-screen virtual Spinning® master instructor – at home in your own private Spin class. The state-of-the art touch screen/high definition monitor allows you to work out along with pre-loaded customized Spinning® video classes. You will never get bored on the Star Trac eSpinner as the proprietary randomization program can create over one million possible ride variations. While you spin, the computer gives you rider data feedback including cadence and heart rate. Built on the proven NXT bike design platform, the Star Trac eSpinner features a weighted 43-lb flywheel that simulates the feel of riding a real bike outdoors. It has the Smart Release™ braking system to provide safe, dependable performance, and other high-end features such as easy pop pin adjustments on the seat and handlebar posts, an ergonomic saddle with anatomical cutout, SPD™ compatible dual-sided pedals, and more. The touch screen display is easy to use and takes any guesswork out of exercising or setting up features on the Star Trac eSpinner. To start a program, select one of three screens. Pick “Spin Video” and workout to a master instructor. You set your level and preferences, and the coach gives you a vigorous, intense workout. Or, choose “Build your Workout” and the screen guides you through an easy set-up of selecting terrain, time, and level. The third option is “Ride to My Media” which gives you the option to dock your iPod, watch TV, or connect a USB stick. When following a Spin workout in one of the first two options, you will ride flat roads, do sprints, or climb hills in and out of the saddle. 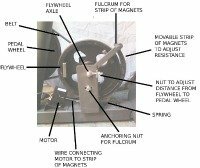 All Spinning movements are based on the sport of cycling. You can choose in-saddle workouts for best aerobic exercises, and out-of-the-saddle (standing) options for anaerobic intensity training. The on-screen graphics will show you cadence, distance, RPMs, heart rate, calories burned, RPE (rating of perceived exertion), and much more. There’s no question that the display screen provides the ultimate in at-home, state-of-the-art training. There are some glitches, however. 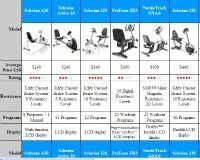 In this 2011 Star Trac eSpinner model, users writing in exercise bike reviews are critical of the Apple product interface. The iPhone and iPod touch don’t work with the eSpinner, and the interface with an iPod has a slow transfer speed. Also, you can’t access your music when you are in the “Spin Video” mode. It’s still a great idea, but hopefully these issues will be addressed on a future eSpinner model with touch screen. This eSpinner will set you back some serious cash: $3,995. For a less expensive alternative, you can buy the popular Star Trac NXT for about $750, which means the TV/touch screen, forward mast, and all the frills on the eSpinner costs an additional $3,500. 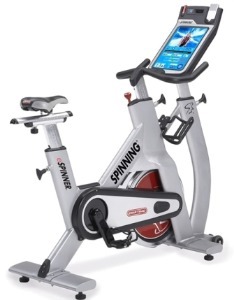 If you really want the on-board training videos, then the Star Trac eSpinner is a good, although exceptionally expensive, choice for an exercise bike. However, if all you need is a superb spin bike, and you can cycle along while watching a Spin class DVD on a TV across the room, then go with the NXT.